This session we'll play one game of 8v8, rotating 3 teams (20 min on, 10 min off). Check-in starts at 8:00pm, game starts at 8:15pm. 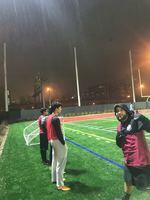 Walden Athletic Complex has turf fields, stadium lighting, water fountains, and free parking. We play in rainy or wet conditions! So if you've seen some rain and are wondering if pickup or leagues are still on, the answer is YES! If there is lightning in the area, the manager will delay play and advise players at the field.